On this week’s Celebrating style, I’m sharing with you my first cold shoulder top, not just of the season, but the first ever. I’m a little behind with this fashion trend! It looks like it’s very much here to stay, though, because the shops are full of them. 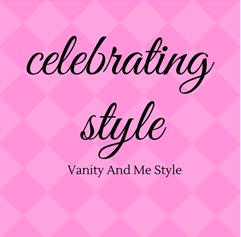 But for me, the most important item in this weeks Celebrating Style post is my new handbag. This has kindly been gifted for me to share from Jay Robinson. A lovely lady who owns Mandys Heaven This bag is full leather, beautifully made and my favourite shade for summer. I always prefer it when a bag has the studs on the bottom. It really makes a difference. There are lots of handbags and accessories to choose on the site, and some lovely items of clothing too, so please do pop over for a look and at the moment you can claim 20% off. I will leave the code at the bottom of the post. Although it’s still a bit chilly today, it’s been so lovely and sunny. I time each day as it’s getting lighter in the evenings. I straightened my hair today because it was windy again! at least it wasn’t like Doris last Friday. Just a small gust of the wind and I look like I’m going to disappear in that hair! I will just stand here a while! The sun is really warm without the wind! I love that bag! Such a chic shape and the color is so pretty! Beautiful jersey and beautiful handbag. I love the delicate color tone of this look. The pants are very elegant. Oh I love the colour! Thanks for sharing with us at #OvertheMoon. I've shared on social media. Have a lovely week! I love the bag! It's a gorgeous colour. The cold shoulder top is super cute as well. I'm quite new to it to be honest. The only thing I've bought so far is the glitzy dress I wore on Christmas day! I did see a gorgeous jumper and stupidly didn't buy it and when I went back it was gone. Bummer! I love the cutout details on the top and that bag is gorgeous. Such a chic look! Beautiful outfit! So glad to be with you on the #fierce50! You look wonderful and I will link up ..thanks for sharing! Thanks for your link up party this week Laurie. Like you, I adore this shape of bag. I've got a dark green one in exactly the same style which I found on one of my charity shopping sprees. The cold shoulder top is sweet and maybe just the right time to show this now that the weather is warming up. That is a pretty bag and it is at a steal! I haven't tried a cold sweater sweater like that before but I would not mind if it looks good like that. Those blues really suit you, the bag is nicely neat. I haven't tried the cold shoulder yet either, but it seems like it's more than a passing fad so who knows! Oh I received a cold shoulder sweater yesterday! So I am very late too! But it looks good on you! I ve checked Mandy s Heaven, what a nice items! The Snake print bag is gorgeous and she sells great tops and cardigans! Loving the baby blue bag … perfect with your outfit! Thanks so much for sharing with Fun Fashion Friday. It feels good to catch up with everyone! Lovely look, and honestly I have off the shoulder tops but no cold shoulder tops either! love the peek of the shoulder for a bit of sexiness. Lovely bag! We are both carrying the same robin's egg blue colored bag today! Such a polished look! I love your top and bag. I have yet to purchase a cold shoulder top. I've tried a few on and just didn't like the way they look on me. I might have to skip this trend. Love that bag and that top! You always look so put together. Everything you wear fits you perfectly. Beautiful bag! And your outfit is equally lovely! Lovely colour combination and the bag goes beautifully with the top! I haven't bitten the bullet yet with cold shoulder tops..I thought they would have gone by now but as you say, the stores are full of them! You look great in this cold shoulder top. I like the colours and stripes. And I love this cute bag. Leather bag for 48 ? Great. The colours are so beautiful. Thank you Laurie for link up hosting. I do love the open shoulder shirts—they just seem so interesting! We were out to dinner tonight and I saw quite a few of them on other ladies!! It's so refreshing to see women having fun with fashion! Blue is a good color on you so I can see why it's a favorite of yours. It took me a while to warm up to the cold shoulder look too and I think you made a great first choice. The sweater looks lovely on you and it will be a fabulous as the weather starts to get warmer. That's a beautiful bag, Laurie! And the top is cute, too! Thanks for the link up & have a great weekend! Gorgeous bag. You are such a bad influence on me. I must go and look, but good value. Leather at that price.